Robert D. James, Jr. was sworn in as DeKalb County District Attorney in November 2010. As DeKalb County District Attorney, Robert oversees 155 employees while administering a $12M annual budget and prosecuting more than 8,000 felony cases each year. Robert is a graduate of Middle Tennessee State University, where he earned a Bachelor of Arts degree in History After graduation, Robert moved to Atlanta where he earned a Juris Doctorate from Georgia State University College of Law. Prior to becoming District Attorney, Robert served as the DeKalb County Solicitor-General which prosecutes criminal misdemeanor offenses filed in the State Court of DeKalb County. In 2008, James launched the Jobs Not Jail- a year-long initiative providing first-time offenders with an opportunity to complete their education, participate in job/life skills training and provide job placement. Since being elected in 2007, Robert has made tremendous strides in redefining the justice system in DeKalb County through innovative and unique programs such as Jobs Not Jail and Project Perfect Attendance. Robert has made combating elder abuse and exploitation in Georgia a major priority of his administration. He and his staff actively with VALARI- a non-profit dedicated to addressing the growing need for senior safety. Through his annual Senior Ball & Expo, he has created an on-going outreach and educational initiative aimed at combating crimes and scams targeting elders and vulnerable adults. Robert is a well-respected member of the legal profession and has been recognized for his talents by Georgia Trend Magazine by being named one of the State’s “40 Under 40”- a distinguished listing of Georgia’s top corporate and political leaders under 40 years old. 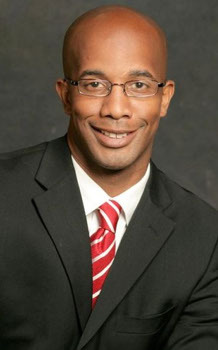 In 2011, Robert was appointed by Georgia Governor Nathan Deal to the Judicial Nominating Committee and has also been recognized as an “On The Rise” recipient by The Daily Report, “40 Under 40” minority lawyer by The National Law Journal and “Who’s Who in Law & Accounting” by Atlanta Business Chronicle. In 2013, he was named “Newsmaker of the Year” by Atlanta’s leading legal trade publication – The Daily Report. In 2014, The National Bar Association recognized Robert for his work in combating recidivism in Georgia. Robert is a native of Murfreesboro, Tennessee. He is the son of Rev. Robert D. James, Sr., a minister, assistant high school principal and retired NFL football player, and Barbara James, a retired educator. Robert is married to wife Karria and is the proud father of two daughters and one son: Brookelyn M. James, Elizabeth N. James and Robert D. James III.